Prime Minister Narendra Modi attended an event to mark two years of the NDA Government in office. 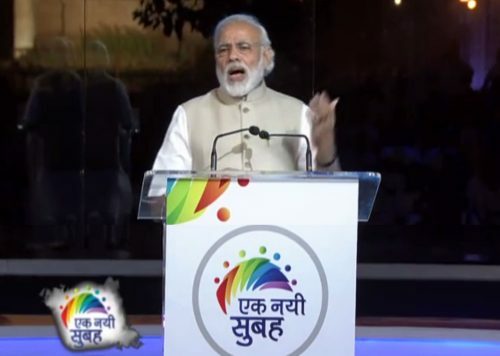 Speaking at ‘Ek Nayi Subah’ event in New Delhi, the PM highlighted the unprecedented measures that the Government of India was undertaking to transform India. The PM said that it was important to trust the citizens of India. PM Modi remarked that the NDA Government was taking numerous measures at fast pace that were benefiting people across the country. He remarked that the Government would leave no stone unturned to make fruits of development reach the poor section across the country. He also shed light on several schemes like Soil Health Cards, Crop Insurance schemes and Give it Up campaign that were giving a new dimension to the poor and marginalized.